Naira Depreciates Against The Dollar,Hits N208 From N191.50. 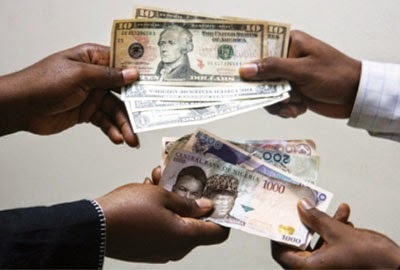 The Naira on Friday depreciated against the dollar as it traded at N208 from the N191.50 it sold for on Monday, Jan. 19. The rate has made the naira to lose N16.50 within five days. The CBN’s website, however, put the Naira against the dollar at N167.50, while the Pound sold for N253.20 and the Euro stood at N193.89? The development has resulted into speculation in the market and caused ripple effects on other currencies. A some Bureau De Change and Black Market operators in Lagos, said that they could not give rates to the Pound Sterling and the Euro. Dealers who preferred anonymity said that there was scarcity of dollars in circulation. They said that the Central Bank of Nigeria (CBN) had stopped selling forex to the Bureaux De Change, since last year. The dealers added that the recent review of trading positions for the forex trading positions of banks to 72 hours, also contributed to speculation in the system. The effect, they added, was that the naira could depreciate further by next week.